Even though SwiftKey remains the top paid app in the Google Play Store, a new beta proves its creators haven't put a predictive period at the end of its Android keyboard's development. The SwiftKey 4.5 beta adds more than 500 emoji faces to the letters, numbers and symbols that users are accustomed to seeing from the keyboard app. Emoji representing everything from smileys and sports images to traffic signs and musical references are all part of the release. The emoji icons can be accessed through a popup panel. Tabs split the fun little pictures into five categories: people, objects, nature, places and symbols. As you might expect from the minds of SwiftKey, the emoji in today's beta are just as much a part of the predictive candidate bar as any matching word. "If a user starts typing 'pizza' they might see a tasty slice being served up on the candidate bar," illustrated SwiftKey. Even more timely for the holiday season, entering in the letters for the word "Santa" suggests a Christmas emoji. SwiftKey is even poised to learn which emoji icons you usually type after words and names. "If someone regularly uses a particular emoji next to a specific word, such as their girlfriend's name and a heart symbol, it will learn to suggest it in future," noted SwiftKey's press release. More productive than exciting, the SwiftKey 4.5 beta on Android introduces an optional dedicated number row, which the company said was added by popular request. It appears at the top of the keyboard instead of forcing users to hold down the top row keys or toggle between numbers and letters. 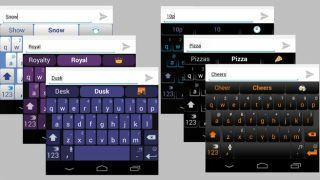 SwiftKey 4.5 can be downloaded in beta form through this APK right now. Read: Twitter's year in review highlights top tweets and trends of 2013.